McConaughey’s charm is one of the positive aspects of the film and it is easy to see how he could command a group of disheartened people and get them to band together to fight back. The Civil War was a time of turmoil and strife in this country, especially for the southern states. The Confederate Army was full of farmers who were not quite sure why they were fighting and while they were away their farms were being ransacked by the very people they were working for. Adding to that, rich slave owners were becoming exempt from fighting in the war they mainly created in hopes to keep slavery alive. With all this infighting, the south began to unravel and eventually had no other choice but to surrender. One of the many people destroying the confederacy from within was Newton Knight (Matthew McConaughey; Dallas Buyers Club). Newt Knight was a nurse for the Confederate army but when his young family member was sent to the front lines and killed Newt decided it was time to bring the boy's body home to his mother and deserted. Hunted by Confederate soldiers, Newt is aided by slaves and ends up in the Mississippi swamp along with some runaway slaves. As the war drags on and more farms are destroyed and deserters are hiding out, Newt finds himself the leader of his own ragtag army set to right the wrongs of the Confederate and Plantation slave owners. Armed with principles and a few random weapons, Knight and a band of men, including slaves, waged their own war and stole back food and supplies, some of which were rightfully theirs. Seen as outlaws, they hid in the swamps and lived modestly while fighting for justice for the local farmers. After the war, they went back to farming but, even though little changed, Knight lived with a former slave and had children with her. McConaughey's charm is one of the positive aspects of the film and it is easy to see how he could command a group of disheartened people and get them to band together to fight back. His Newt is charismatic and intelligent, if not a little bit greasy (I know it was meant for the movie as baths weren't readily available to 1860's renegades, but it was kind of distracting all the same). Gugu Mbatha-Raw (Concussion) as slave turned Newt's lover, Rachel, was terrific as she played well against McConaughey. Her strength became apparent with every scene and she commanded attention every time she was in a shot. Other strong performances include Mahershala Ali (House of Cards) as runaway slave Moses and Keri Russell (The Americans) as Serena Knight, Newt's legal wife. Writer/Director Gary Ross (SeaBiscuit) takes a compelling story and somehow manages to water it down and make it less exciting than it should be. The story of Newt and his Army could have been the only focal point of the film, but Ross mixes it with the Rachel slant and some Knight descendent on trial 85 years in the future for being one eighth black and marrying a white woman which was illegal in Mississippi in the 1950's. Even without that little plot twist, the film would have been interesting (perhaps even more so if he had concentrated on only the war, slaves and deserters and expanded on the after effects - or lack thereof – of the war). The Blu-ray is presented in 1080p High Definition video with a 1.85:1 aspect ratio. The colors of the south and the swamps show up clear with a large mixture of greens throughout. The DTS-HD Master Audio 5.1 is sharp, accentuating every bit of gun fire and cannon blast. Unfortunately, the mix isn't great and I kept needing to adjust the volume in order to hear the dialogue after each battle sequence. The lone extra on the Blu-ray is an interesting 18 minute look at the History of Jones County and includes interviews with historians and descendants of Newton Knight. The story looks at the Civil War from a whole new angle, which is somewhat interesting, and the production value is excellent. Unfortunately, the script veers off so the film ends up often wallowing in limbo. A good cast and realistic war scenes (warning: somewhat gory and not for the faint of heart) can't save this movie from languishing by the end. It's worth watching once, but not sure it's one that needs to be added to your home video library. Download Free State of Jones from the iTunes Store in Digial HD. 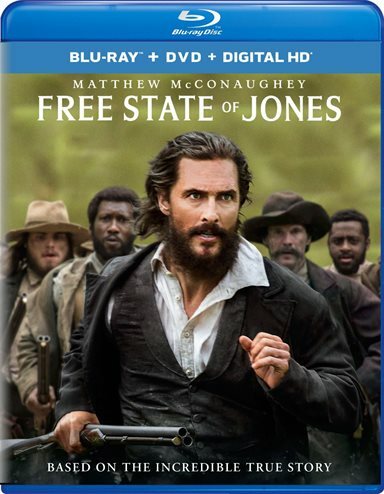 For more information about Free State of Jones visit the FlickDirect Movie Database.